Aiming at more sophisticated manufacturing, we have taken innovative steps in developing advanced technology and materials as well as a new method of manufacturing. Recently, we have received requests from aircraft manufacturers to produce prototype components. Our upset forging method with our original upsetter makes it possible to achieve remarkable material yield and increase the precision of products, which realizes high quality, low cost engine valve production. 40 years ago, our company invented air-cooling hardening for heat-resistant steel engine valve parts, using our original continuous thermal refining furnace. Furthermore, 30 years ago, our company pioneered direct quenching from forging temperature using a water-soluble agent. This energy-saving and environmentally friendly method has become an industry standard in modern manufacturing in Japan. In collaboration with a die set maker, we developed a single set-up die, in which only a cartridge is needed to be exchanged. 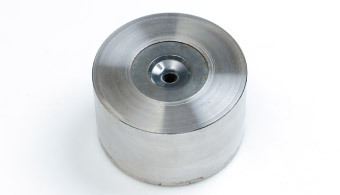 This method has spread at home and abroad as an industry standard of press die setting. We developed a hot forging die made of ceramics, a brittle material, and succeeded in preventing brittle fracture as well as effectively utilizing the characteristics of ceramics. The technology of Ceramic Die Hot Forging was presented the ‘Technology & Development Award’ by the Japan Society for Technology of Plasticity in 1995. In 1996, we were granted a patent right for the Technology of Ceramic Hot Forging Die. The performance and the strength of our Ni based alloy “EXEO-NF90” is evaluated between Inconel 713C and SUS 310S. This high-performance and cost-effective material was developed in a joint research project with a leading material maker. The characteristics include being highly heat-resistant and corrosion proof. The High-Pressure Sliding Method is a severe plastic deformation method developed recently by the researchers of Kyushu University for a grain refinement of metallic materials under high pressure. We are now in a joint research project with the researchers from Kyushu University. Our group applied HPS for grain refinement to Mg alloy (AZ61), high strength Al alloy (A2024 and A7075), Ti alloy (ASTM-F1295) and Ni based super-alloy (Inconel 718). We have succeeded in grain refinement to the micrometer range and confirmed that super-plasticity appeared in all alloys. 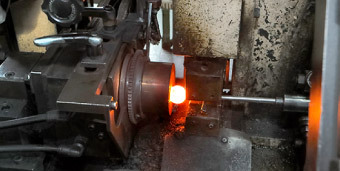 Combined with our core hot forging techniques, we will be able to develop a new dimension of manufacturing methods and products. We were awarded ‘Best Poster Award’ at the 12th International Conference on Super-plasticity in Advanced Materials (ICSAM) 2015. Our Research and Development Project was accepted into ‘METI’s Supporting Industry program, known as SAPOIN. Development of characteristic modification of Ni based highly heat resistant alloys and high performance turbocharger components. Development of a new mass production method of modifying the characteristics of hard-to-deform materials into ultra-fine grain materials which display superplastic behavior, enabling the production of the most advanced turbocharger components. In 2012 we were accepted into ‘METI’s ‘Subsidy program for the development of prototypes by small and medium scale enterprises’. 1. Production system for small lot orders of high precision forged parts, utilizing a combination of hot and cold forging techniques. 2. 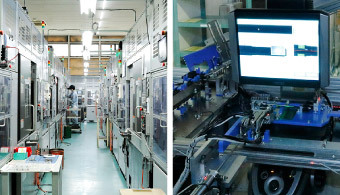 Production system of prototype manufacturing with very short lead time, utilizing state-of-the-art facilities. 1. Automation of machining hard-to-manufacture parts for fuel-efficient engines by creating cutting-edge facilities. 2. Welding technology of engine valves of abrasion-resistant alloys for next-generation engines. In order to develop various advanced technologies, we are collaborating with advanced institutions such as Kyushu University, National Institute of Advanced Industrial Science and Technology (AIST) and Nagano Prefecture General Industrial Technology Center. In the process of shaft machining using NC lathe, we developed our original automated machining system, which measures circularity, exact length, outer diameter and valid outer diameter of a screw and then identifies defectives automatically. Measurements are displayed on the screen, and revised data is fed back to the lathe. 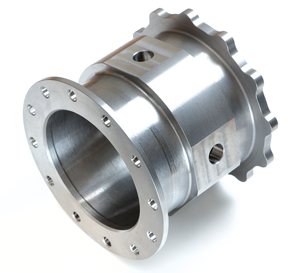 Revised machining work is then carried out, which improves precision and stability of machining process. Since our Research and Development project was accepted into the National Strategy for Supporting Industry of METI in 2009, our theme has been to develop high performance mass production forging process of Ni based alloys. We manufactured prototypes for aircraft components. In 2016 we were accepted into METI’s regional core enterprises support project, and as such were designated as an enterprise to produce prototypes for aircraft engine components.